I ripped off a taxi cab driver in Mexico, without meaning to. My phone died right before I was ready to get back to Nogales, Ariz. I’ll be back to pay him soon. Reporter Javier Panzar overcomes his fear of reporting in Spanish and finds new perspectives from those in truly alienating circumstances. A walk through the mountains of Catalina State Park was not without its obstacles: 98-degree heat and warnings of rattlesnakes and scorpions. Spacefest is an annual convention celebrating all things, well, space. Its third year in Tucson, Ariz., there were astronauts, intricate spaceship models, neato meteorite jewelry, and plenty of nerds. Nerds, by the way, are awesome. Without further ado, here’s a peek at the convention. Halfway through the hike, after talking to a hiker who sipped from a water reservoir on his back, I realized my mistake. My water bottles were sitting on the roof of my car. As a native of Tucson, I should have known better. Spanish was James Barragan’s first language. He spoke it like a native speaker. Or so he thought until he put in a few long-distance phone calls to Mexico for a story. For the first time in their lives Kristian and Danya Hernández move into a college dorm. The two are the only married couple participating together in The New York Times Student Journalism Institute this year. Where Institute reporter Joe Fitzgerald meets a Trekkie who helped NASA research health conditions for manned missions to Mars. For two men from Wisconsin, a trip to Ajo, Ariz., was almost surreal. The desert, the remote outpost of the Pima County Sheriff’s Department, the work thee officers have to do, combined to make an impression. Maria Camila Bernal shoots a small video on her iPhone. She blogs about her love for horses and the lessons learned. Art collectives regularly adorn their buildings with chaotic, vibrant imagery, but so do many businesses in the area, giving Tucson’s downtown and arts district a distinct feel. Reporter Joe Fitzgerald, rum and Coke in hand, sees another planet with his own eyes for the very first time. Vanessa blogs about the steps she took to get the final layout of the plane graveyard photo essay and story page. Read as she explains why she didn’t pick two of the three versions. 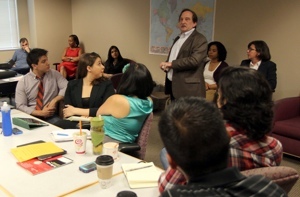 The 2013 class of The New York Times Student Journalism Institute started in Tucson, Ariz. Twenty-three students will tackle Tucson news for two weeks with the assistance of reporters and editors from The New York Times and The Boston Globe.